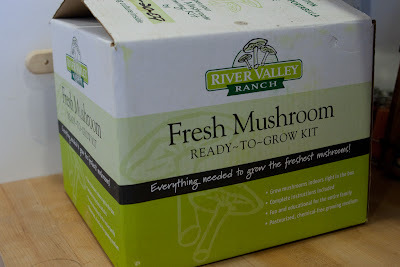 On the last farmer’s market day of the year (around Halloween), we bought a Grow-Your-Own-Mushrooms kit from the farmer we usually buy mushrooms from. Great novelty gift, to be sure. We couldn’t resist. 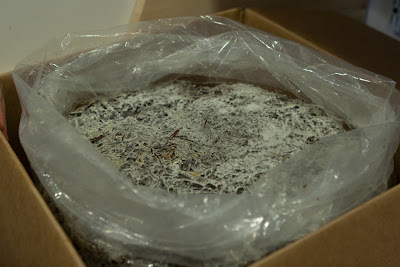 It’s a medium-sized box that’s really heavy, a solid 30lb brick of soil which is pre-seeded with mycelium. 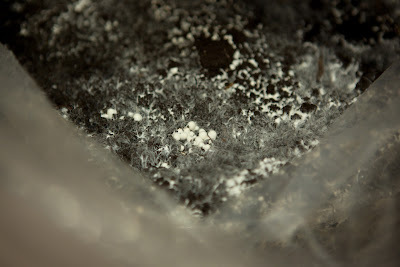 In case you missed Mycology 101, mycelium is the white stringy mat of threads which is the real fungus itself. 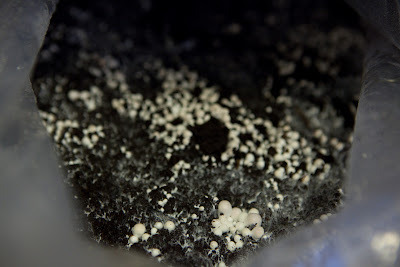 When mycelium threads intersect from different organisms, they combine DNA and produce mushrooms as a ‘fruit’; the mushroom then releases spores from its vents (on the bottom of the cap) to spread new mycelium. In a nutshell. 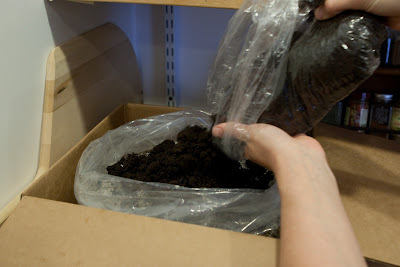 …just add some peat moss to the top, water the whole thing, then wait 2 weeks. Day 21, time to harvest! 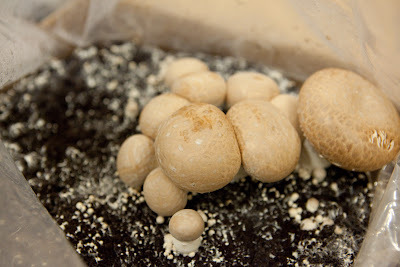 The cap’s diameter is twice the size of the stem length. …which we then ate in an omelette. Yum. Many more mushrooms to come over the next month. Wow, you just grow it in the box? 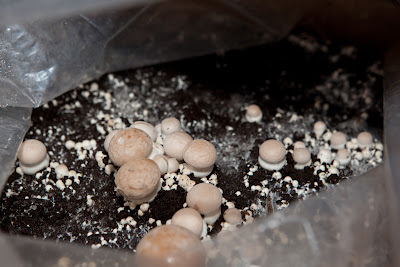 That box looks sufficient to inoculate about an acre of mushroom beds! Of course, keeping it inside helps avoid volunteers, which I dunno about you, but *I’m* eternally grateful to “someone else” for knowing the difference between the edible and the poisonous kinds! Glad it was you and not me that our daughter experimented on. Some women poisoned Clint Eastwood like that in an old movie, and he died.